We are starting the BM#43, week 1 and I will be doing all Dhoklas. 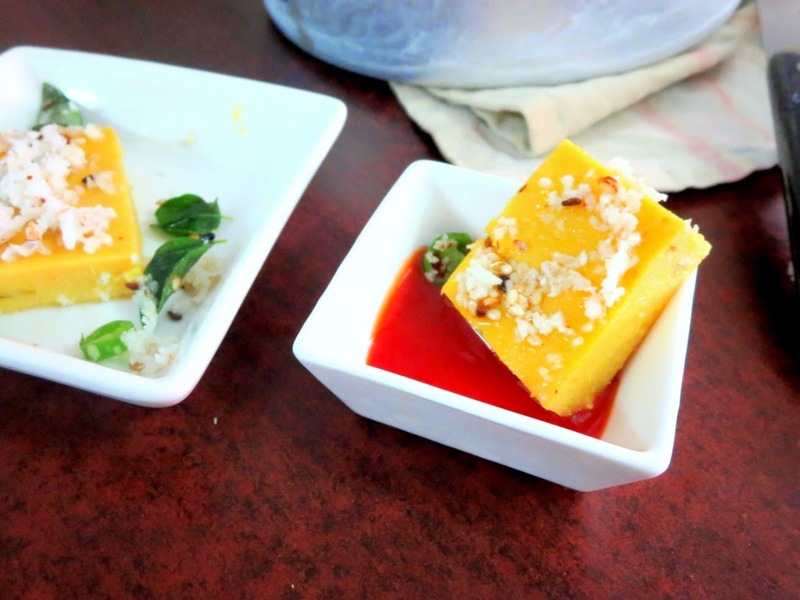 The idea for this came when I came across a huge collection of Dhokla recipes stored away and decided I should at least make use of those recipes. 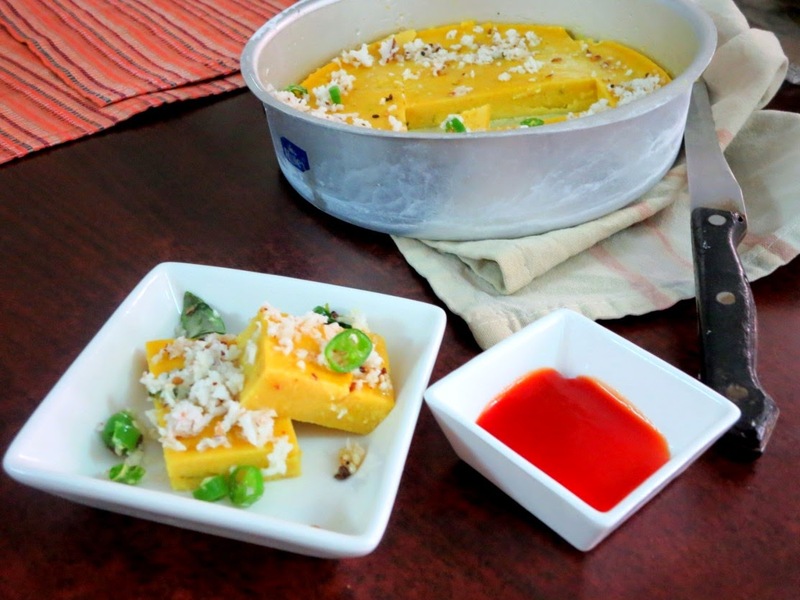 I wanted to make sure these Dhokla recipes help people plan their breakfast or dinner better. If you are used to serve such low cal or almost no oil dishes, this works out best. Apart from planning on getting this fermented, this dish works out quite easily. I served it with tomato sauce, you could do green chutney as well. The only thing it really mattered is, one should make sure this doesn't get fermented for long. When I fermented overnight, the batter turned a bit more sour than expected, even though the curds used was not sour at all. So fermenting for just 4 hrs or 5 hrs should make this alright. 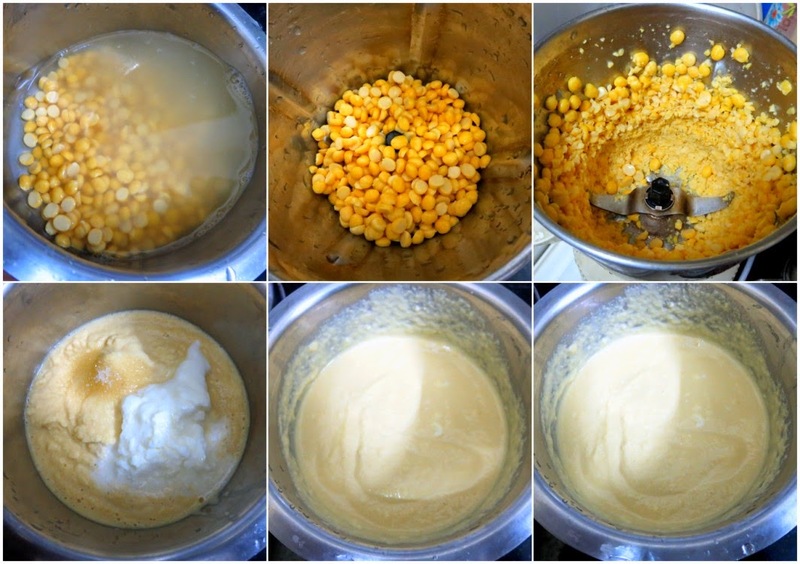 Soak the dal in water for at least 2 hrs and blend with the curds to form the consistency of pancake batter. Mix in the sugar and leave in a warm place to ferment overnight. When the batter is fermented, add in the remaining ingredients, combine everything well. Grease a mould or other suitable vessel and place in a steamer. Add the soda bicarb to the batter and mix well till light and fluffy. Immediately pour into the prepared vessel. Cover and steam for 20 minutes. Remove, cool and cut into cubes. 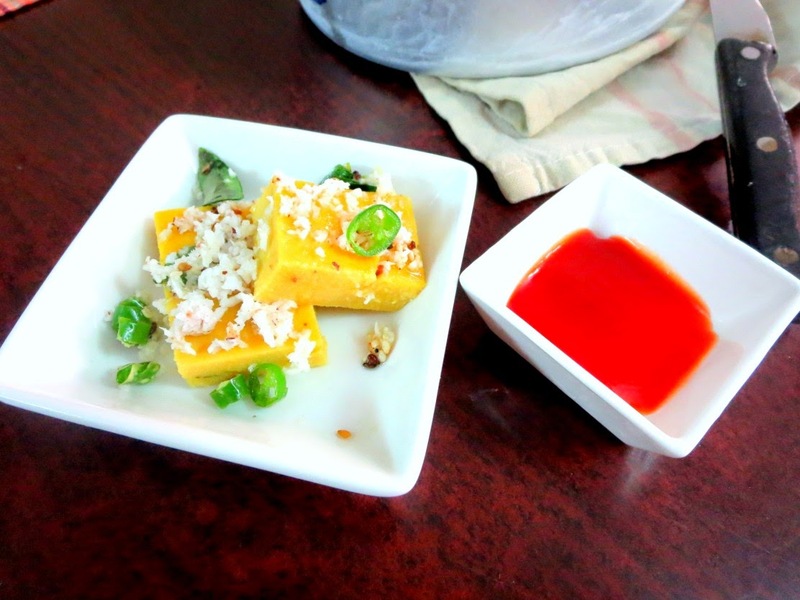 Pour over the dhokla cubes. Garnish by sprinkling grated coconut and coriander leaves. The first batch I made I added less than the required soda, this made it not as spongy as it should be. 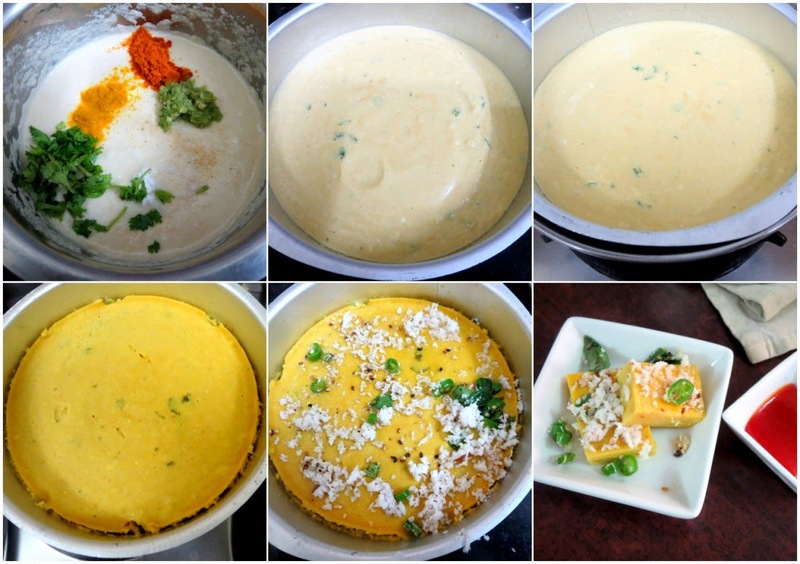 Be sure to add at least 1 tsp or a little more for the Dhokla to be spongy. 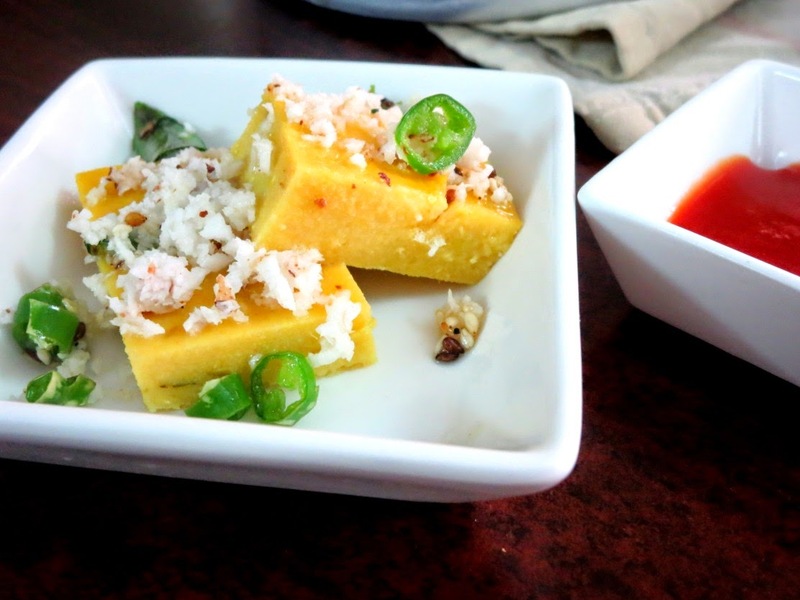 However this Dhokla is surely soft and very tasty.